The world doesn't level up with you Jez, each area is locked to a certain level range, it tells you the level if you zoom out on the map. I have found bows to be under-powered, but I disagree on everything looking the same. The areas I've been to so far have varied quite a bit. The mission board quests are repetitive, but you can ignore them doing the main story quests and ones that appear on the map as exclamation marks should be enough to level you up. Well fella my belief is that it does or at the very least there's some jiggery pokery going on. The starting island kephallonia was level 12-12 when uninstalled. It certainly wasn't level 12 when I began the game. I have to agree, the world levels up with you, but in my mind that is a good thing as it prevents you having the walkthrough syndrome that was a part of Origins. I still maintain that Jez stopped before the world and plot properly opened, but as I advised Wrathbone if you aren't a fan of AC titles this has enough AC to make you stop, which Jez has demonstrated. Am I sorry that this is the case? Yes. Do I disagree with Jez' decision? No. God I am so drunk as I type this, you have no idea of the effort to keep it cogent! Which sort of also brings me to another gripe with the game. Loot, and how little it means. It had no semblance of permanence whatsoever. I got given "Nicholas sword" at level 10-11 this is a legendary orange item which I worked hard to that point to get. Literally one level up by me (and the world around me) and it was massively outclassed after that. Utterly useless. I was finding "common swords" that were out performing it and because of the nature of levelling up I couldn't justify using it as I was struggling to land decent hits on even grunt level enemies. So the game in effect totally devalues any sense of finding what ought to be very special items as they relate to the common items to be found in the world. Dunno I'm still salty about the whole thing and it's probably a totally personal opinion but the derivative way Ubi designs the features and game at large is just terrible. They clearly have the nouse and talent to do so much better. The effort put into world building and graphics etc is admirable. It's not just about the base stats, you also need to consider the engravings the weapons have and the buffs that they give to various stats. I've kept using some weapons a few levels lower than me because they boost my stats more than a weapon that just has a bigger base dps. It's very rare that you will find a common weapon that is massively better than blues/purples or yellows you find. You can also upgrade weapons at the blacksmith which is pretty viable early game, it starts to cost quite a lot later, allowing you to keep using a weapon you like. Yeah this, especially when you get them engraved in ways that complement your build. Of course, all good things come to an end, and I was eventually spotted. Cue igniting my sword (engraved to do more fire damage) and wading into a pack of about 5 enemies. I ended up wiping out the entire garrison before looting the place and finding my quest goal. I just love the freedom. There is SO much to do, I just pick and choose what interests me. Currently level 22 and still having an absolute blast, but I do love me some open world goodness. Some of the more unusual photos I have taken in the game. 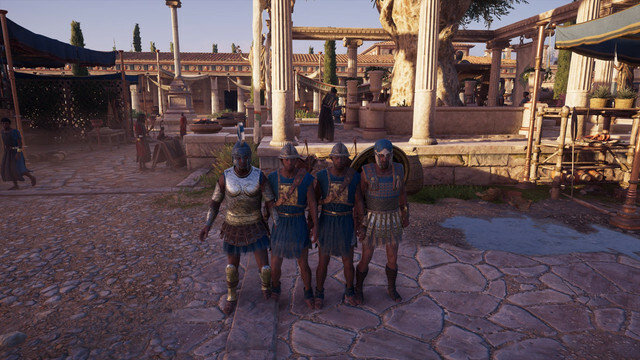 A group of Greeks posing for a selfie. 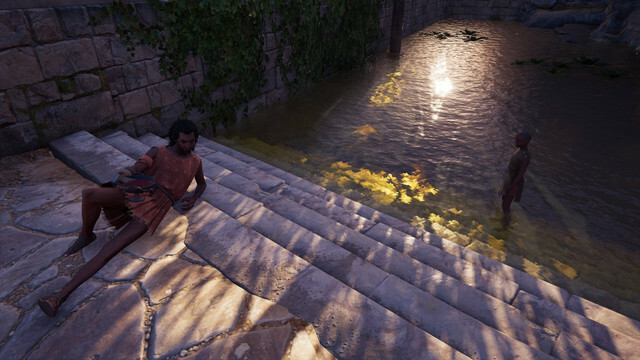 An Athenian enjoying some wine by a sewer. That's not a toilet mate! I'm nearly 60 hours into Odyssey and still enjoying every second of the game. Last-night I got another reminder fo how beautiful this game is. I was doing some questing in Elis and one of the quest asked me to head to a cliff overlooking the main city. As I got there the sun was rising and seeing it feed down the valley and bathe the city in sunlight was amazing, spent about five minutes taking photos. Then later I was in the swamp area during sunset and everything was bathed in an orange glow, it reminded me a lot of the Velen swamp in the Witcher 3. I continue to be dumbfounded by talk of the game being artificially lengthened, last week someone on the Giantbombcast said they believed you used to level up twice as fast. If that was the case I would have reached the level cap 30 hours ago which would have been bad as I'd barely seen half the game so would have spent the rest of the time doing stuff and not getting better gear or more skills. In my mind there is no substance to back-up the belief that the game was lengthened on purpose. I think the fact that using an XP doubler would see you hit the cap in half the time and not have experienced most of what the game has to offer puts that idea firmly to bed. The game is just big and just because you don't level up every hour doesn't mean the game was lengthened on purpose. I think it's a shame that this idea has managed to attach itself to the game as it has no doubt put some people off of what is in my opinion one of the best games of this year. It's a beautiful world full of detail, interesting characters and fun quests. And I'm done, 10 minutes short of 70 hours, all three main questlines finished. I have had a lot of fun with this game, it doesn't do anything spectacular but all the systems it has are well put together and compliment each other really well. 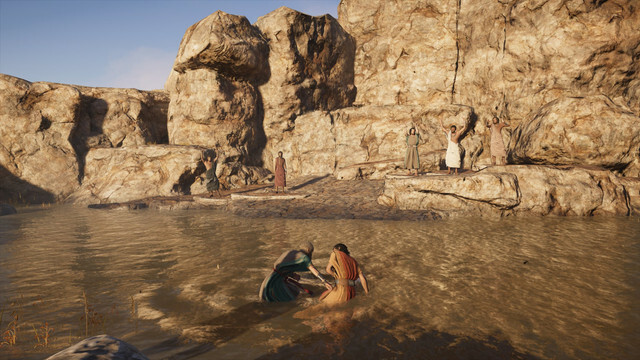 The combat never got boring even after taking over my 100th fort, hunting down the Cult was great fun and the most Assassin like thing I've done in an AC game for a long time, and the mercenary system meant I was always kept on my toes whenever engaging in large fights. 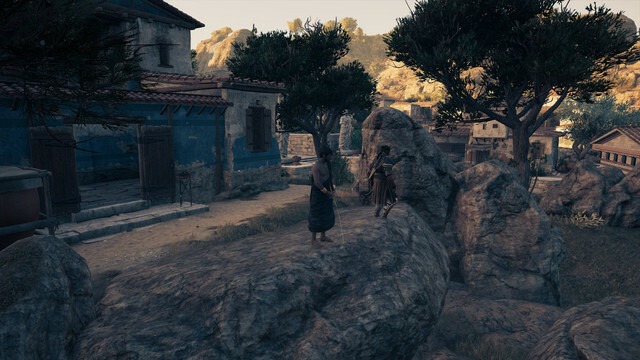 The fact that the game was split up into islands and territories meant that as well as telling stories that spawned the whole Greek world, Ubisoft could also tell more focused ones that were limited to one island which really helped with the variety of stuff you were doing. It also meant when you reached a new island you didn't know if you were going to partake in some one self-contained quests or you were about to set off on an adventure across the world. Most of all Odyssey allowed me to have fun and I find that this is an element of gaming that is often forgotten about. Games are predominately about having fun and Odyssey has allowed me to do this more than anything else I have played this year.